A great entry level guitar with a hard shell case..
Every journey starts somewhere and the Apprentice is a trustworthy place to begin. Washburn's experience ensures you get a guitar that is the perfect balance of stability, tone and cosmetics. 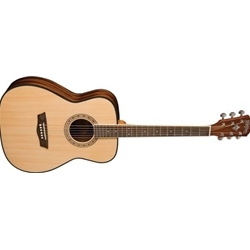 It features a premium spruce top with mahogany back and sides for a full rich tone. Those seeking a guitar that sounds great, looks great, plays great and will serve them well as they progress will find the Apprentice series perfectly suited to them. As one begins their journey, protecting your guitar against knocks and scratches is essential. All Apprentice 5 guitars are priced to include a hardshell case.